Are you still upsetting about expansive electric charge because you always forgetting to turn off the light when you left home? Sometimes, you would think if only I can turn it off right away. And have you ever imaging that you can open the heating on your way home so you can enjoy the warmth as soon as you get home? Now, with this Wifi smart socket, it can turn your imagination into reality. 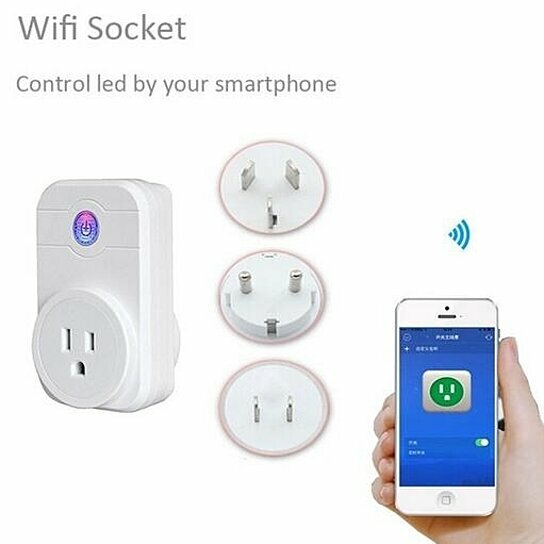 Remote control: user can turn on/off your home electronics that connected to the smart socket wherever you have internet. User-friendly switch: micro-electronics switch with feedback LED light. It is convenient and effortless to use even at night. Watchdog function in Wifi module: no need to worry about the problem of off-line. A new way to schedule: it supports setting up 20 timing tasks. Energy-saving and economic: saving your electric bill by running the house on your schedule. Good company for smart home: with it, there is no need to worry leave with lights on. And you will never come home in a dark house. Small size with powerful function: it can be applied to water dispenser, air cleaner, night-light etc. Safety first: overload protection, when the voltage is too high, the product will power off automatically. Easy and effortless to use and install.